Spread out among 17 tracts in the woods around Mendon, 150 acres of red pine are coming down this year. The trees are being removed due to red pine scale, an invasive species that preys on the coniferous trees. “If they’re not harvested they’ll lose value and become a fire hazard,” said Rutland City Public Works Commissioner Jeffrey Wennberg. Red pines are characterized by their tall height and straight growth, which makes them a top choice for telephone poles. Red pines also grow quickly and are planted in areas to restore forests. In Mendon, many red pines were planted over non-operating farms in the 1930s and 1940s. The invasive insect is found throughout southern New England, New York, New Jersey and eastern Pennsylvania. The insect burrows into the sapwood of the tree and carries a harmful fungus similar to Dutch elm disease. The species targets pines of any maturity. Symptoms of infestation were first observed three years ago, when pines were observed dying from the bottom branches moving to the top. 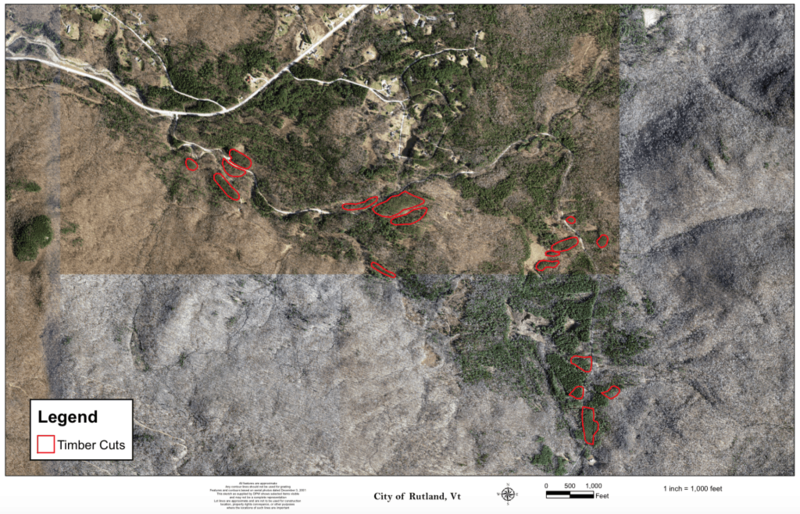 The Rutland City forester contacted the University of New Hampshire, which has been studying invasive species in forests. Wennberg said he expected some species to appear in local forests, including the Emerald Ash Borer, the Asian Longhorn beetle, and the Hemlock wooly adelgid, “but this one took us completely by surprise,” he said. Study from the University of New Hampshire confirmed that red pine scale was present. Rutland City is the largest taxpayer in the town of Mendon, owning about as many acres for its watershed as the city occupies—about 4,000 acres. The city has received a heavy cut permit from the state and has put out a call for bids. Depending on weather, the first tracts will be cut later this summer. Wennberg said he expected the project to last one to two years. After being cut, the trees will be sold. Wennberg said if the cutting is done with caution, the forest will regenerate. While limiting the spread of red pine scale locally, the cut will not stop the infestation from spreading in forests in northern and southern Vermont. “I don’t want to predict that this is a firewall against spread … it’s spreading all over northern New England quite ferociously,” Wennberg said. White filled areas show where diseased trees are to be removed in Mendon. As a life long resident of Rutland, I know this area well. I was just up there not four days ago and saw all the markings. These tress are in the midst of many saplings and other trees. I don’t see any way of preserving the other trees and completely destroying everything else to tell you the truth. I am no stranger to logging, and I know how it’s done. Skidders will have to be used in the process. These machines tear up the land, and it can’t be helped, even with every level of caution. My big question is this. How much of this is about the claims, verses being about the money? And what is this going to mean for our watershed since it’s right there? Wheelerville Rd & the Notch Rd is about to get real ugly… What a shame. Don’t go confusing me with tree hugers. I simply have little trust in light of the clear deception that takes place today, at the local, state and federal levels.